The Father says today, I will not leave you in torment. I place no premium upon human suffering, for I took your pain upon the cross that you might be delivered and set free. I came to bleed and die that you might have life and have it more abundantly. There is no abundance in hell. There is no blessing in torment. I took the torment, so you don’t have to. I carried your sin away as far as east is from the west, so you could look upward with hope and not condemnation. You are not condemned. You are forgiven. You are redeemed. You are set free even this day. You don’t have to wait to go to heaven, for I am bringing heaven to earth in your life today. I am working in your life today according to the principal of “as in heaven so on earth” until heaven is the only comparator you can draw on to describe what your life looks like. Do you know in whom you have believed, says the Father? Have you believed the good report that originates in Me, or are you believing the evil report out there in the world that is seeking to make merchandise of you? Reject the narrative of unbelief. Refuse the torments of the negative that would wrap their tentacles around you and rob you of your peace. Heaven and earth will pass away, but My word will never pass away. Though all creation would be destroyed in a moment of time the only experience of it on your part would be instant fullness of joy in My presence. As I am from above, so you are from above because I have redeemed you to Myself. The enemy can no more steal from you than he could pilfer the treasuries of heaven. Fear not, says God. Have no fear for I am with you. I am with you and I am in you and in that one great truth is your stay and your strength and your protection from every outward threat. Yes yes Amen Father thank u Jesus. Russ & kitty thank you for your words & laying your life down for other to have a breath of life! I listen to the morning light and your relationship with each other brings Joy to me! Thank you! Thank you Lord! I need you more… even in the darkest night. You’ll hold me. Thank you my loving Father! Amen recieved in Jesus name. Amen Hallelujah Glory Russell your prophetic word is powerful God bless you. « Morning Light – April 4th, 2018 – Luke 8: Are You Willing to Offend those with No Faith? 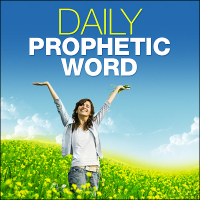 Subscribe to the Daily Word!